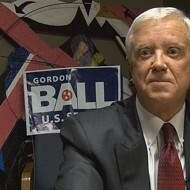 Gordon Ball, the Democratic nominee for U.S. Senator, was in Memphis last week, and he sat down for a lengthy interview on his campaign and his hopes for an upset victory over incumbent Republican Senator Lamar Alexander. 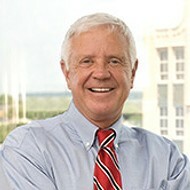 As Ball noted, Alexander had eked out his renomination on August 7th, polling slightly less than 50 percent of the total vote in a Republican primary in which he was opposed by state Representative Joe Carr, a Tea Party supported Middle Tennessean, and George Flinn, the multi-millionaire Memphis physician/businessman. 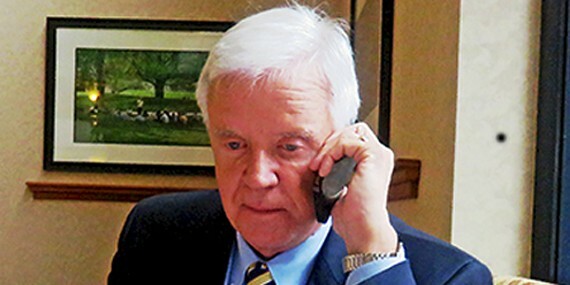 Carr, who finished strong with 40 percent of the total vote, had gone unmentioned for most of the primary campaign, Ball noted, but toward the end of the race, Alexander had begun making formal attacks on his main challenger by name. "When he started mentioning Joe Carr, it was a sign that things were getting tight for Lamar," Ball said. Ball has challenged Alexander to a debate but doesn't expect that to happen. "Lamar's going by the incumbent's playbook. He's not going to debate me. He will never mention me, unless it gets close." From that standpoint, the Democratic nominee can take heart from a response to his candidacy this week by the state Republican Party, which has not only mentioned him but has incorporated his name in a brand-new website entitled ObamaBallAgenda.com. According to the site, Tennessee faces a veritable liberal onslaught this fall in the form of various nationally sanctioned candidates and causes. 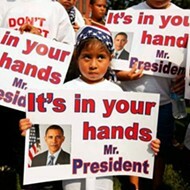 And, "at the top of the ticket, will be a man who would be one more vote for Barack Obama's harmful agenda — Gordon Ball. Mr. Ball, a liberal personal injury lawyer from Knoxville, will only serve to empower Obama and strengthen Washington's stranglehold on our economy." Ball sees the relationship between himself and the national Democratic Party quite differently. Noting the disinclination of the Obama presidential campaign to pump much in the way of resources into Tennessee during the 2008 and 2012 races, the Knoxvillian said, "I think the national Democratic Party has written Tennessee off. That's not good for the state." But he shrugged and said, "That's all right with me. We'll run without them." A corollary to what Ball sees as a lack of interest in Tennessee from national party sources is the fact that the Tennessee Democratic Party itself is not exactly in the pink of political health. Rather famously, the party has, within the past decade, lost control of the governorship and the General Assembly, becoming little more than a token minority in both the state House and the state Senate. And, for the second time in the past two statewide elections, Tennessee Democrats have failed to mount a serious challenge in a major statewide race. In 2012, the party suffered the embarrassment of seeing Mark Clayton, an off-brand candidate with alleged membership in an anti-gay hate group, become its nominee against GOP Senator Bob Corker in an almost unnoticed Democratic primary. And in 2014, via yet another back-burner primary, the Democratic candidate who emerged as the party's nominee for governor, to oppose well-heeled incumbent Republican Bill Haslam, is one Charlie Brown, a retired construction worker from Oakdale, Tennessee, whose victory in a large but largely anonymous primary field owed much to his name, redolent of a well-known comic-strip character and alphabetically first on the Democratic primary ballot. With the wry grin that seems an innate part of his persona, Ball commented, "I wish I had his name recognition." But the fact is, Ball represents what both Democrats and Republicans recognize as a serious political possibility. He and fellow Knoxville attorney Terry Adams conducted a primary race that, in the quality of its rhetoric and intensity, was something of a throwback to the now vanished time when Democrats ruled the state. Their race went down to the wire, with Ball, considered the centrist in the race, prevailing on August 7th with 36.5 percent of the Democratic primary vote, against 35.6 percent for Adams, an unabashed liberal. 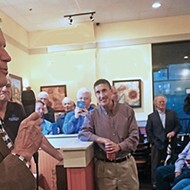 The two Democrats had actually agreed on most issues — including a need for an increase in the minimum wage, support for parity pay for women and the pro-choice position on abortion, provision of equal opportunity for the gay community, and full-throated backing of the Affordable Care Act (Obamacare) and of Medicaid expansion in Tennessee, where, Ball says, some 160,000 people can't get medical care and 28 hospitals are in danger of closing for lack of the ACA-provided Medicaid-expansion funds. He and Adams had differed most notably on Ball's espousal of a flat tax, which Adams considered regressive and counter to the needs of working people and a possible barrier to his post-primary support of Ball. 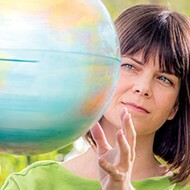 Again, the Ball shrug — indicating, in this case, flexibility on the issue. "We need tax reform. I don't think anybody disagrees. I just want to be in middle of that debate. And I'm for whatever helps the middle class remain strong and viable and that can raise money to pay off our $17 trillion debt." In any case, Adams wasted little time climbing aboard the Ball bandwagon and now serves as his former opponent's East Tennessee co-chair. One edge that helped Ball in his primary campaign was the wealth amassed during a long and successful legal career. 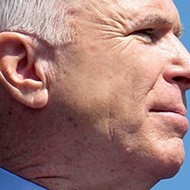 To a certain degree, he can self-finance, as he did during the primary, shelling out some $400,000 for TV ads. He knows, however, that Alexander himself is flush and suspects that Governor Bill Haslam, scion of his family's Pilot truck-stop fortune and beneficiary of a hugely successful GOP fund-raising campaign, will help the GOP out-spend him. The point gnaws at Ball. "I'm going to make a strong statement," he said: "This state is controlled by the Haslam family. Think about it. They own Bob Corker. They own Lamar Alexander. And they have the governor's seat. Now what else do they want? ... It's just not right that one group of people controls this state. If you don't think that's happening, you're living on another planet." 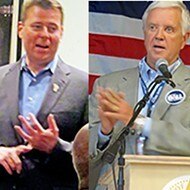 Citing polls by Rasmussen and The New York Times that show something like a 47 percent to 32 percent edge for Alexander, Ball predicts the kind of shrinking in the incumbent's margin that occurred late in the Republican primary, and partly for the same reason — distrust for the incumbent among Tea Party Tennesseans. "We don't agree on every issue, obviously, but they see Lamar as being for Common Core [in education] and amnesty [on the immigration issue]. They're against Common Core and amnesty, and so am I." He has worked up a good case of scorn for Alexander, whom he once supported and whom he now sees as having fallen ito irrelevance from what had been a valuable public career. "How do you go from a job that pays $150,000 to being worth $40 million?" he asks rhetorically. "He just needs to take his money and go home." Ball gibes at the incumbent Senator, who back in 1978, dressed in a plaid shirt, had based his campaign for Governor on a walk across the state." Things — and Alexander — have changed, Ball maintains. "He said in the primary that citizens of the state of Tennessee could ask him questions if they saw him walking down the street. Well, I've been in Tennessee for 65 years, and I've never seen him walking down the street. If I ever do see him, I've got some questions for him."